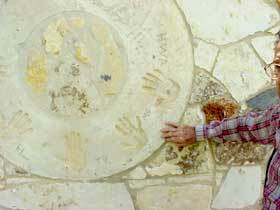 His stone-handler hands, even at age 93, are still strong. His handshake is firmer than most men and he even challenged me to an arm wrestling contest. I would have let Hough LeStourgeon, the man whose company built the original part of the Frontier Times Museum, beat me at arm-wrestling, but I knew he wouldn't have wanted to win that way. Just the fact that he challenged me and showed up half an hour early for an interview shows that the type of spirit it took to build the Frontier Times Museum is still going as strong as the museum itself. It should also be pointed out that I did not beat him. I just held him off, much to his delight. 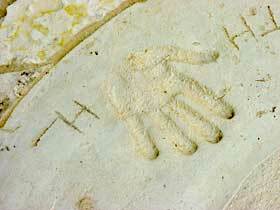 The handprint and initials of Hough LeStourgeon, as well as the overall quality of his work, are still apparent at the Frontier Times Museum. Hough LeStourgeon is greeted by Frontier Times Museum Director Jane Graham during a recent stop at the local museum. LeStourgeon, a 93-year-old resident of Medina who still has strong and steady hands, helped do the stonework on the original building, which is today the northeast part of the museum. In the top right hand corner, is a picture of the museum in its original form. Imposed on top of the picture is a picture of the Frontier Times cover, and the founder of the museum and the magazine, J. Marvin Hunter, Sr.
Hough LeStourgeon points out some of the more interesting stone work on the building's facade. J. Marvin Hunter, Sr. instructed him that he wanted to build a fire resistant building constructed of jagged stone. Look closely at a stone circle on The Frontier Times Museum's east side and you will see the initials H.L. Those letters stand for Hough LeStourgeon. He helped build the museum with his own strong hands. The museum also served as the first offices for the Bandera Bulletin, which began publication 1945. "(J. Marvin) Hunter owned the property and wanted to house a lot of stuff in there so he asked me about building it," LeStourgeon said. "The stones came from all over the county. They came from fields and many of them from along the river. You'd have to pay for them now, but back then they had a lot out in the pastures and you could have them just for hauling them off. Old man Hunter told me he wanted only jagged rock." The stone circles in the wall, like the one with the initials H.L.., took three to four men just to lift them up, he said. No doubt they were big men, just like LeStourgeon who stands at least 6 feet, 2 inches. One of the stone circles is four feet in diameter with a 22-inch hole, and was reportedly used as the top of a well by pioneer settlers about a century ago. It now serves as the window in the northeast wall. Hunter's son, Warren, painted a picture of Indian Chief Geronimo on the glass in the center. What used to be the original entrance to the building has been moved to the west by a few feet. LeStourgeon said Tom Anderwald put the original roof on the building. He added he's not sure, but he thinks the original part of the building, which takes up about half the building's space today was built for about $2,000. His wife Joyce, 88, recalls labor was not hard to find in those building days because many able-bodied men were looking for work as the nation began to emerge from the Great Depression. Ground was broken on January 1, 1933 and construction started immediately on a 20 X 40 foot structure that practically lies in the shadow of the Bandera County Courthouse on site once called Delightful Hill. According to the booklet, The History of the Frontier Times Museum published by J. Marvin Hunter, Jr. in 1987, the unique museum was formally opened to the public on May 20, 1933 with great ceremony. Printed invitations were sent to all who had participated in the project and many came from great distances. A barbecue lunch was served and dedication services were in another historic structure, the First Baptist Church, which recently marked its 120th Anniversary and is located just across the street. The museum was not large enough to handle the crowd that had gathered. Much of the stone used in the construction was derived from an old rock fence built near Bandera in 1878. 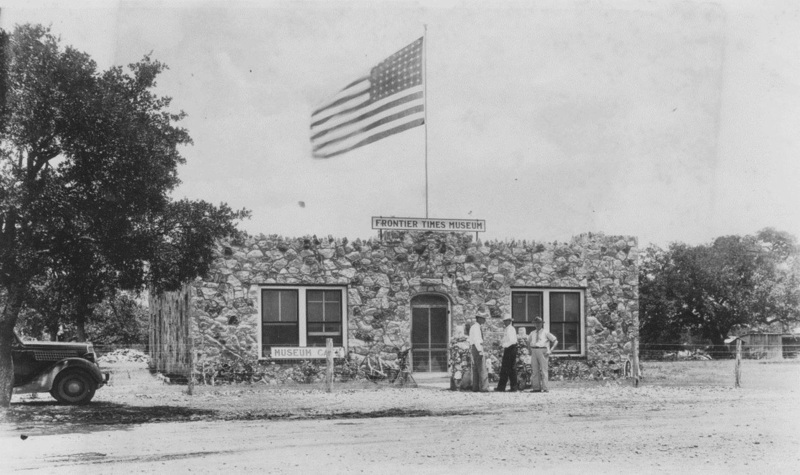 The use of the fieldstone in the building trade was new to Bandera in the 1930's. The booklet on the Frontier Times says LeStourgeon learned fieldstone working with master masons in San Antonio. He said he did learn some things from a man named Joe Rosas in San Antonio, but he says most of his knowledge was self-taught and also learned from having to make structures with stones when he was still living with his family as a youngster. LeStourgeon grew up in this area and says he plans to die here. Judging by the looks of him and sharpness of his mind, it might not be any time soon. "I outlived a lot of my friends, but that's just life," LeStourgeon said with a laugh. Perhaps it is because of the keen appearance of the Frontier Times Museum that so many houses and buildings in Bandera today still retain the distinctive look of stone. Among them are the almost 90-year-old Bandera Middle School building. Petrified wood, fossils, cave formations, and odd shaped stones can all be found in the Frontier Times walls. One giant ammonite came from the Pecos River. Be sure not to overlook the fireplaces. The one on the east side of the building is full of fossils and the one of the west side has Hunter's name spelled out in marbles. The fireplace with fossils has imprints of petrified clams, often referred to as sea snails. Above the mantel is an old millstone which was brought to Bandera in 1854 by Mormon colonists, led by Elder Lyman Wight. Embedded in a lower part of the millstone is a stone resembling an ear of corn. Flint arrowheads are inlaid on the tip of the mantel. In the floor of the main room are flint arrowheads arranged in the profile of an Indian. While the building is constructed of stones, one could argue that paper and good writing were every bit as important in its formation. Even with the nation still emerging from the Great Depression, J. Marvin Hunter's writings and publications were so much in demand that he could build such an impressive structure in Bandera. J. Marvin Hunter, Sr. moved to Bandera in 1921 and purchased the weekly newspaper, The Bandera New Era, in 1921. He also had plans to publish a magazine, Frontier Times, which would include his accounts of encounters with many early day characters from the Old West. The Frontier Times history booklet states the magazine began as a hobby, but despite the advent of the Great Depression in 1929, it gained wide readership throughout the country. Readers of the publication were encouraged to contribute their own tales in addition to stories by Hunter. Stories from Texas, New Mexico, Arizona, and Oklahoma rolled in and readers also brought Hunter tools, household utensils and other pioneer items. Soon the little den in the New Era office, which was only about 64 square feet, was filled with relics ranging from photographs to bridle bits. By 1932, the office wall was knocked out and the room was expanded to 8 by 26 feet. Hunter began to think seriously about building a museum, but the Depression was near its deepest point. Banks were failing. The weekly newspaper was barely making its expenses, and the list of Frontier Times subscribers had decreased from 3,200 on Sept. 1, 1929 to a low of 900 five years later. Hunter, however, kept his chin up and kept his pen and presses rolling. A building had to be built, he reasoned, and it had to be fire-resistant. He decided to print a book, an edition of 1,000 copies, and sell them for $1 each, to raise $1,000. That amount would be enough to erect a stone building, he estimated. With the harsh reality of the Great Depression, he modified his plan. He offered a two-year subscription to the Frontier Times, and a copy of the book for $5. Then he offered, for $3 each, a year's subscription to the magazine and a copy of the book to 100 subscribers to raise $300 more. Then he planned to sell 200 copies of the book individually for $1. All added up, it would equal, he hoped, the stone building of his dreams. The plan was announced through his weekly newspaper and the Frontier Times magazine. Response was slow at the start from the newspaper readers, while the magazine readers responded much more enthusiastically. By mid-December, things had panned out pretty much as he had planned them and he had enough to money to start the Frontier Times Museum, which still stands proudly at the same location today, and which has attracted untold thousands of visitors during its proud history. The Authentic History of Sam Bass and his Gang was the first book to be printed to raise building funds. It sold quickly and is a collector's item. To show his appreciation to those who purchased the book, Hunter had their names engraved on the two granite pillars flanking the building. Later, as rooms were added, the names of other book-buying museum supporters were placed on bronze tablets in the building. One of the bronze tablets, contains the names of 450 people. Twenty-four states and two foreign nations are represented among those listed. In raising funds for the construction, Hunter did not ask for free-will donations nor did he seek federal grants. He wanted the Frontier Times Museum to stand on its own and to be free of federal regulations. After only a year, the collection had outgrown its space. More space was needed so Hunter published The Life of Big Foot Wallace, which he sold for $1 per copy. With little effort, the book brought in enough money to build a 24 by 40 foot addition that was opened in the fall of 1934. When it came time to expand the Frontier Times Museum, Hunter came calling on LeStourgeon again, but this time his company was busy building the structure that houses the Bandera Electric Cooperative. The new room was dedicated to the memory of frontiersman William A.A. Wallace, Ð otherwise known as Big Foot Wallace. The huge footprints can be found in the room as a reminder of its namesake. When the second room was built, a bronze tablet was inscribed with names of those who purchased copies of the Wallace book, and it was placed in the room. Another tablet of sheet copper contains the names of the more than 300 people who purchased copies of the book. In the fall of 1934, Hunter sold his weekly newspaper, the Bandera New Era, and retired from newspaper work so he could devote his full attention to Frontier Times Museum and similarly named magazine. In the spring of 1935, he added a 16 by 40 foot room to the structure, and that fall installed a modern printing plant in the northeast corner of the building. In addition to printing the magazine every month, he also printed such publications as A Brief History of Bandera County and Cooking Recipes of the Pioneers. The items in the Frontier Times are well worth the price of admission: $3 for adults and $1 for children. It should be noted that Hough insisted on paying $6 for his and his wife's admission to get into the museum he helped build. Hours are daily from 10 a.m.- 4:30 p.m. and on Sunday from 1-4:30 p.m. The staff is more than helpful and has a good knowledge of the estimated 30,000 items in the museum. Over the years, improvements have been made. The museum is well air-conditioned, being more thoroughly catalogued all the time, and has a quality security system. Hunter once remarked that he did not collect items so much as they collected him. Just a few of the items include Lottie Deno's Trunk, which was owned by the famous lady gambler. Hunter later wrote a book to let people know that he had known her personally. The Charles L. Fagan room includes pioneer items from South America. It is named after the museum's most frequent contributor, a New Jersey man who traveled frequently. Fagan donated one of the museum's most popular items, the shrunken head trophy from Ecuador. Believed to be the head of a teenaged girl who was victim of a blood feud, it measures only 3 by 4.5 inches and has been darkened with charcoal. The shrinking is done by removing the skull and bone structure and packing the skin in hot sand. A shaving horse used to make roofing material, old Edison phonographs and a Washington hand-press used before the advent of more modern printing methods also are inside the stone walls. The museum is mostly of frontier relics, but also has items from the Orient and Europe. Many of the items from the Orient are donated by Louisa Gordon of San Antonio, whose donations include a collection of 400 rare bells. Elephant bells, Russian Sleigh Bells and a sturdy Manchurian bell that is believed to date back to the 14th Century are included. A Chinese gong from the Ming Dynasty, 1368-1644, is also on display, as is a plate from The Golden Temple of Krishna at Benares, India. Other items include those relating to Bandera's famous rodeo history, including one for "Toots" Mansfield who was inducted into the Rodeo Hall of Fame. Ray Wharton, Buddy Groff and several other famous cowboys also are recognized. The Doane Foundation, funded by Mr. And Mrs. F.B. Doane, bought the museum in 1960. Hunter passed away on June 29, 1957 at the age of 77. A recently discovered newspaper obituary in the Bandera Bulletin states that Hunter talked frequently and entertainingly outside of the museum at 13th and Pecan. Of his character, it states, "Although he did not always condone, he seldom condemned, even when there was provocation." In 1972, the Gallery of Western Art was added. A collection of paintings by Mr. Doane and other artists is on display in the room along with a safe that was blasted open in 1930 during the robbery of Bandera's First National Bank. About $4,000 was stolen. Two of the robbers were caught. Two got away and the money was never recovered. Also on display is old-fashioned dental equipment used by Dr. J. Greer on patients from Bandera, Medina and other locations. At least as far as children are concerned, perhaps the most popular item in the museum is the two-headed sheep. The glass-encased snowy owl is also quite a sight, as is the old Tarpley telephone exchange. 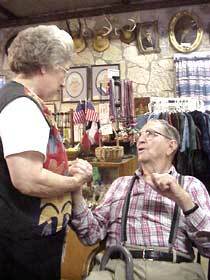 With all the items on display that represent the best of Bandera County and beyond, it's little wonder so many local history classes make the visit regularly. One thing's for sure: The way it was built by people like Hough LeStourgeon, it's sure to stand a long time. Among the other projects LeStourgeon built are the building that today houses Wells-Fargo, and a house that lies northeast of the Frontier Times Museum. It has a distinctive stone façade and is as strong and stable as the man from Medina who helped build it. Hough LeStourgeon was named after a Civil War Major, but through his works of construction, such as the Frontier Times Museum, he has built a name for himself.